Welcome to the Conversation through art discussion. "I love hearing what art means to different people... To me art has many meanings. I do believe art is everywhere. It is in sky, in the trees, in the water, it is in our soul." Please add your comments. Just tap on a story and it will open to a larger story and tap on comment. Just got back from an early (6:30 am) morning walk with my wife on the Inverness Boardwalk. I have lived here all my life and I am still amazed at the beauty that surrounds us on a daily bases. 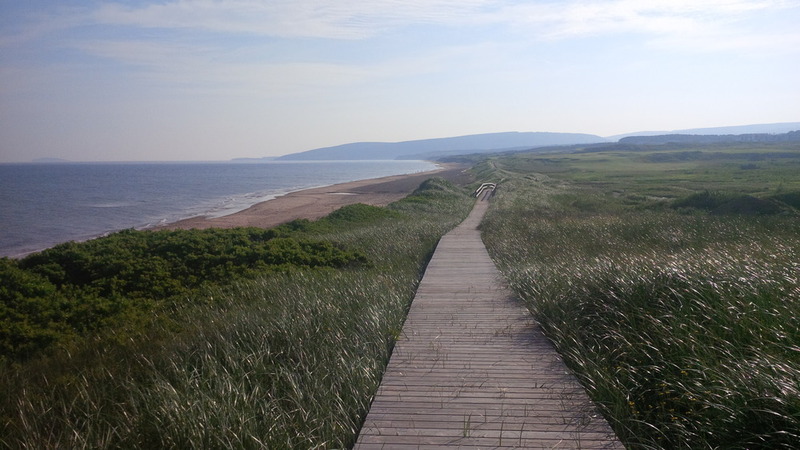 This boardwalk runs between the 3 mile white sandy beach of Inverness, the warm waters of the Northumberland Strait and the first class golf links course, the Cabot Links. On a clear evening you can even see PEI. Get here when the tide is low and you have beautiful sandbars and you can even watch or play a little golf! Of course ealry in the morning with a nice breeze you can just breath in the natural beauty of it all. That is just the morning! This coast also boasts some of the best sunsets of the world. As I head into my studio for the day my soul is filled and my head is full of the voices of our ancestors. What can I say I love this place and yes it is full of inspiration.